If you're looking for trip in summet to holidays or else then you are at the right place. Now is the time to book. 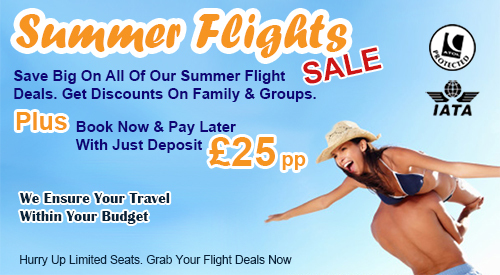 Search for the amazing flight deals on offer. Save big on all of our summer flight deals. Get discounts on family and groups. Plus you can book now and pay later just depositing £25 per person. Do not miss out these offerings. Take advantage of our greate offers. We ensure travel within your budget. Call now.